In their widely-cited Wall Street Journal column last week, Ian Bremmer and Nuriel Roubini argue that to prevent asset price bubbles in the future the Fed should focus on “properly calculating asset prices and the risk of asset bubbles according to the Taylor rule, an important guideline central banks use to set interest rates.” Central bankers such as Bill Dudley and Kevin Warsh of the Fed and Mark Carney of the Bank of Canada also propose that asset prices be factored in to interest rate decision criteria such as the Taylor rule. Adding asset prices to the Taylor rule would be a big change because the Taylor does not now incorporate asset prices, and much research, including Ben Bernanke’s research ten years ago, shows it shouldn’t. The rationale for the proposed change is that the sharp run up in housing prices, which lead to the financial crisis, was caused by interest rates being too low for too long. If central banks had taken account of housing price inflation they would have raised interest rates earlier—so the story goes. They would have stopped the bubble before it got so big, or burst it when the burst would not have caused so much damage. I agree that the Fed held interest rates too low for too long, and I provided evidence of this at the summer 2007 Jackson Hole conference. But the problem was not that the Fed ignored the housing boom. The problem was that it caused it. Look at the nearby chart from The Economist. 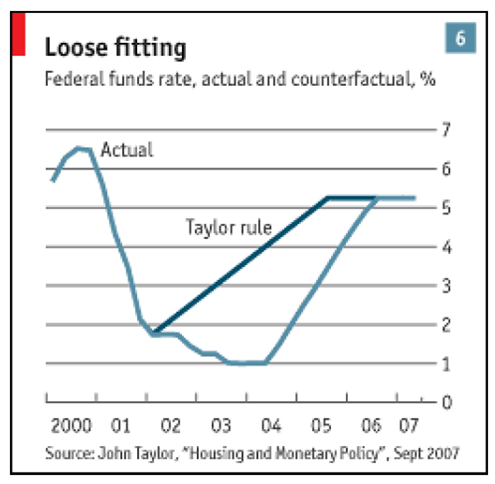 It shows the Taylor rule without any asset prices and the actual interest rate. Clearly interest rates were too low. By deviating from the rule and keeping interest rates too low, the Fed caused the acceleration in housing prices. If the Fed had simply conducted monetary policy as it had in the 1980s and 1990s, we would likely not have had the housing boom. Even putting aside the problems of identifing asset bubbles, pointed out by Donald Luskin, or the danger of creating collateral damage by doing so, adding asset prices to the equation would not address the real problem. Saying that adding asset prices to the central bank’s rule would prevent bubbles is like saying that requiring hikers in the forest to carry cell phones to call the fire department will prevent the damage from forest fires they start. By the time they call and the fire trucks arrive, the heat and flames will have caused tremendous damage. Far better to prevent hikers from starting fires in the first place. Far better for central bankers not to create bubbles in the first place.